The decision to go outdoors for the Monday shoot was because Nariese insisted our model Pau must look great in natural environs. I gave in. I was hesitant that we’ll be shooting where everyone else does their pre-nup and cosplay shoots (UP Diliman), but we really didn’t have much of a choice. I was concerned about being cited by security, too, but since Pau was still studying there, I held on to that silver lining. Still, I wasn’t all too confident. Part of my first model shoot was also held there, and I wasn’t all too happy with the output. The time where I got genuinely excited was seeing Pau posing with the sun behind her, her brown hair glowing, and her smile innocently captivating. As always, Nariese’s choice of clothes was impeccable, the accessories stood as integral accents to the model. I honestly felt inferior to all these elements, but like anyone who finds himself underwater, I had to swim. Sorry, the metaphors are probably because I’ve been wolfing down Haruki Murakami audiobooks non-stop. So there, the sun was cooperating, we found ourselves shooting at random spots and benches, until someone noticed red leaves sprawled on the ground. 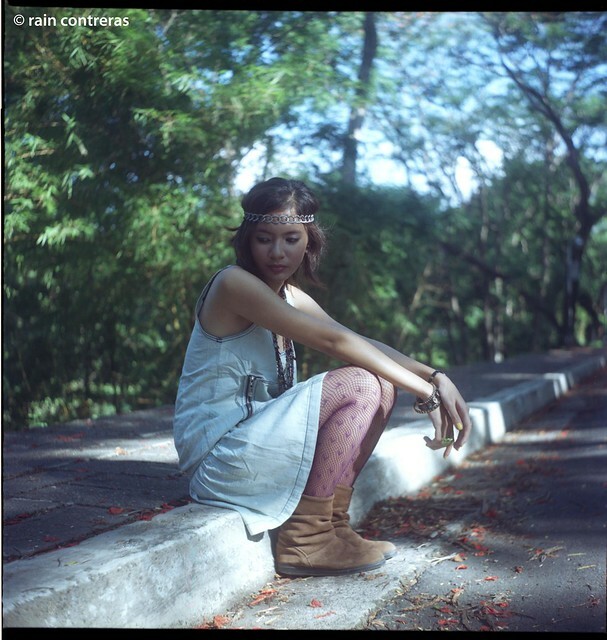 I asked Pau to sit around it, and positioned her where the sun peeked through the tall greens of the area. I had a hard time shooting though, something about my eye still adjusting to the scenario. Add the constant dodging of vehicles where we were. We had Pau in another getup, and sadly this was when the sun was disappearing already. No matter, we adjusted. I had other scenes in mind, like Pau eating, and doing a docu-style shoot inside the gritty university shopping center. This was early evening already though, and we were all tired. I did push through with those, but had lackluster results. Dinner was with Pau and Van, a common friend of both Pau and Nariese, who tagged along and did the shoot outtakes. Pau was still in awe when I told her my student number. I wasn’t offended in any way, and was more amused than anything. When I got home, looked at the shots, I couldn’t stop sorting and editing, and giving off a controlled beam. The planets aligned for this shoot! Awesome model, style, setting, light, and all it needed was a photographer of the same grade. Oh, and on this shot, Pau looked like a young Amanda Griffin. Seriously. Aby was supposed to be our first model, but she got sick. I met her at Nariese’s grad party, and she was singing Britney Spears songs on karaoke. I texted Nariese either on the same evening, or the day promptly after, if Aby ever did some modelling. She said yes, but not professionally. I saw those model photos on Aby’s Facebook, and found them, well, lacking taste. Not that I am an expert on taste, but like what I would always try to achieve in shooting someone, I want to flatter that person, get her best angle, and of course, just discard those that make him/her uneasy on the eyes. The shoot was Aby was a quick one, since there was another one scheduled after at the studio. Learning from the time management situation from the first shoot (6 hours studio time? ), we just had Aby in two dresses. Those huge eyes really reeled you in, but when Aby goes back to her normal, she-should-be-in-comedy-bars mode, the facepalm moments are neverending. Gliter was there again to help us out instead of modelling. Bam assisted me again, and we were delighted at the new lighting setups Jay taught us that day. I guess we’d all agree that it wasn’t such a bad shoot, even if what we had coming were standard poses, but around the last half hour, Aby began to strut her stuff, show us her potential, and we were all exclaiming that to her, that this should’ve come earlier, not now that we’re rushing it. Gah! In sum, it was a fun shoot, and half of my memory card was filled with the girls camwhoring themselves on the first floor of the studio, flashing their V-signs, and puffing their cheeks, which I guess would be normal for girls about 5 years younger than they were. Ha! Jay’s points of improvement from assessing the shoots: pose and expression. I see this clearly now, comparing to the current output, to what the photos available online, and those magazine covers on the stands. This is duly noted, I just hope I can direct the model on how to give us that all-important, non-gimmick/outing/party look.